They co-sign an array of jewels which they named Espèces, displaying their vision of the mineral and animal kingdoms which both captivate them. It is no accident that their talent, their shared interests, their creations which question life sciences endlessly, would not go unnoticed. Because it is him, because it is her. Because since forever, he draws on zoology, an inspiration and a source of reflection for his work as a visual artist. Because she creates jewelry by working with casting and lost wax. Because together, they work organically, the most beautiful way possible. Since their beginning in 2013, since this initiating birthday present – a cat skull which the jaw ended up as a cast for a solid silver necklace -, this magnetic couple define their path with an almost sacred assertiveness, filled with vertebraes answering to their latin names, with evocations of cellular automatons inspired by a shell, the Conus textile, and with singular crystals, crafted in the metals they cherish, gold, silver and bronze. 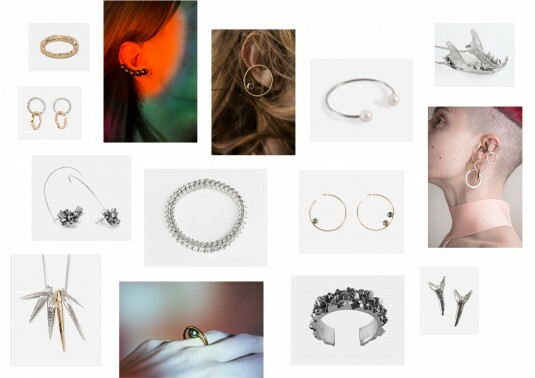 Their new collection bears the fruits of coincidences, from the crystals found on their travels or, better, from the ones they’re growing themselves and which they re-create then as rings, earrings, bracelets or fine and textured necklaces. If they do not neglect their first loves, they now dare to delve into smallness, the graceful sculpture, the diy randomness and beautiful new takes on classics. Never refraining themselves from doing anything, not even some installation art which appeals to the imagination.